Changing Hip Hop culture forever! On April 21, 2016 we held a ceremony to usher in the new Green Age of Hip Hop where Elders, Hip Hop pioneers and legends gathered to sign the 10th Element of Hip Hop Health & Wellness Proclamation . This historical proclamation adds Health & Wellness as the new “10th Element” to the culture of Hip Hop. This proclamation is more than just a document it represents a movement of people within Hip Hop culture who are committed to supporting health & wellness in our communities, we call it “Hip Hop is Green.” You can join the movement by supporting this document.Hip Hop was created in the 1970's and encompasses an entire culture that goes beyond music. Hip Hop is the world’s most popular genre and art form, simultaneously influencing politics, social issues, culture, and society as a whole. However, over time Hip Hop culture has been devalued and degraded. The 10th Element reclaims hip hop culture from its wayward commercialization that glamorizes violence, drug taking, drinking “lean” and other unhealthy and destructive habits that have become symbolic of hip hop culture and has unduly influenced our youth. Now, those behaviors are no longer in alignment with hip hop culture. We are disrupting the negative narrative and are using the power of hip hop to create a healthier community to support the next generation. Please support our effort by taking one step. Make a small donation to our organization. Encourage your friends to donate. We will use these funds to promote the 10th Element live shows, Hip Hop Green Dinners and create inspirational media. 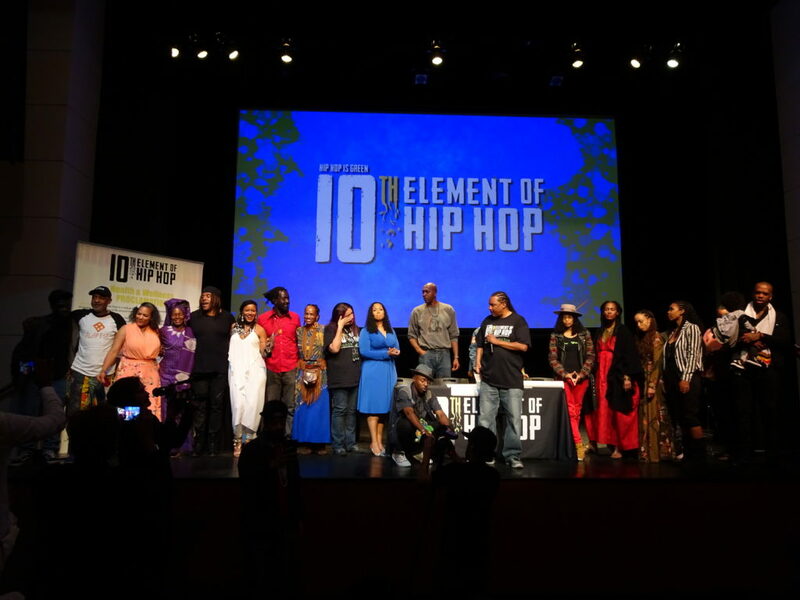 In December of 2015 Keith Tucker founder of Hip Hop is Green sent an "Open Letter to Hip Hop" to many top pioneers and legends stating the case to add a new element to the culture of Hip Hop, the 10th Element and he stated his case of why it needed to be added to Hip Hop culture. Many Hip Hop legends who also already embodied a healthy lifestyle, provided their support. With their approval, Keith Tucker authored the 10th Element and the official Proclamation and arranged for it to be signed at a historical-history making ceremony in New York. On April 21, 2016 at the Schomberg Center in Harlem the official 10th Element of Hip Hop Health & Wellness Proclamation signing ceremony took place with major players in Hip Hop such as the legendary EZ AD and Tony Tone of the Cold Crush Brothers, Stic of Dead Prez, Styles P and Jadakiss, Queen Afua, John Salley, AsheL Seasunz, Supa Nova Slum, Afya Ibumo and celebrity chef Lauren Vonderpool as well as many others who have been instrumental in creating the Green Age of Hip Hop. The 10th Element of Hip Hop is preceded by the 9 elements: breaking, emceeing, graffiti art, deejaying, beatboxing, street fashion, language, knowledge and entrepreneurialism. The Hip Hop is Green team of artists and performers use Hip Hop to speak to youth and spark positive changes in their lives. HHIG provides powerful programs for undeserved, low income urban youth and their families in areas of health and wellness through creative media and live events. The organization provides plant based meals and information as well as resources which help and inspire people to live healthy lives. To date, HHIG has served over 5000 meals to youth and families over the last seven years. Today Hip Hop has become the most powerful youth force on the Planet. If you want to reach youth you have to speak their language and that language is Hip Hop. Van Jones says: "Hip hop is now the drumbeat for the whole world. If Hip Hop decides to move in a green direction the world will move in a green direction." 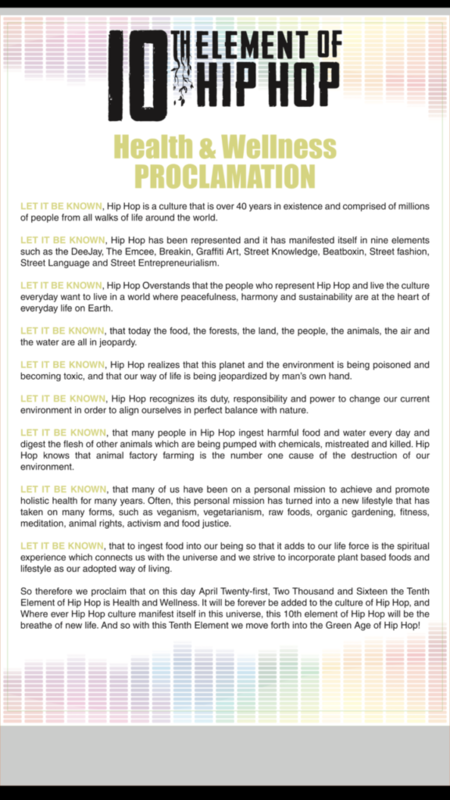 HHIG’s answer to Van is that Hip Hop is officially green and with the addition of the 10th Element and the adoption of the Proclamation in addition to the events and programs that HHIG is implementing around the country we are moving the world forward in a green direction.